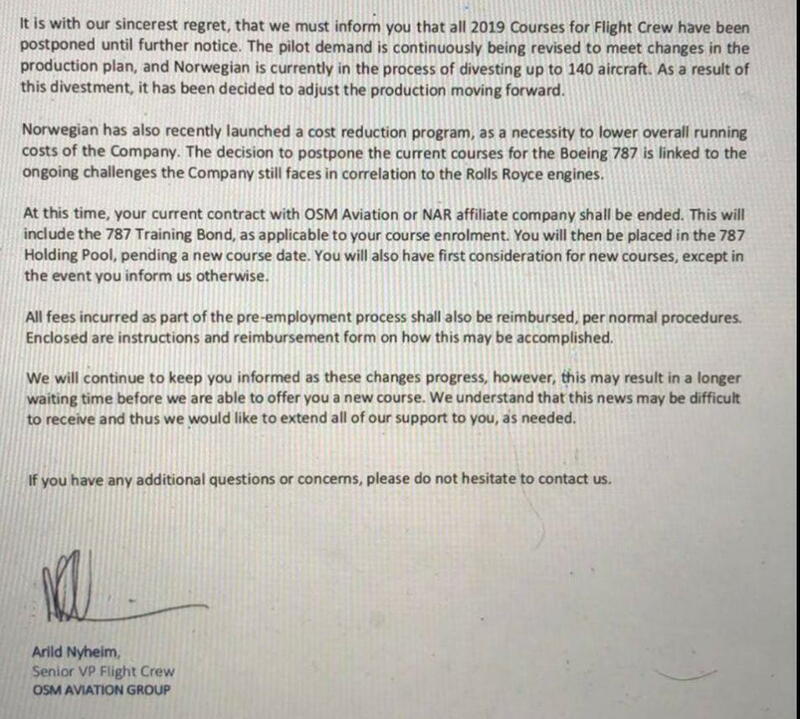 A guy i had in the SIM a couple of times who was due to join us in the New Year has just received this email, is this the writing on the wall for all of us at Norwegian? There is a management meeting on the 7th Jan to discuss more base closures etc, it is not looking good. I think writing on the wall is a bit extreme. The expansion has been consistent and not exactly small, perhaps an adjustment of the expansion plans isn't a bad idea! Seen several internal things with regards to there being progress with the 'joint venture ' etc. Will there be changes coming? Feels like. Doesn't necessarily spell doom and gloom. i think the focus for us will be on the long haul routes, similar to Aer Lingus, hence the interest from IAG, I can see more less profitable bases closing down, similar to EDI recently. They’ll have lost a fortune at Gatwick yesterday too. Apparently they have ten days to receive new equity or they’re in breach of banking covenants. Read into that what you will. Of course someone could pump more money in (and very probably will) but at this stage I think it’s good money after bad, the Long Haul Low Cost model just doesn’t work. I don’t know how many more times people can try or would after this (they will) but it’s got a proven track record of failure. Norwegian are barely profitable in the good times and we’re about to move into some highly uncertain times. They also have the A350 doing ETOPS370 and A330 ETOPS330 just approved both with RR engines so it’s not all bad and not as if other manufacturers are without their faults. We still remember exploding CFM56s and now they’re very well regarded. PW also had a complete uncontainable failure on a A380 in the cruise. dissing your employer. Just goes to show the grass is not always green. Looks like it was a lucky escape that my sim assessment was a complete disaster! Sad to say, it looks like IAG/Ryanair/X Airline will just wait to pick up the assets from the liquidator/slot auction, rather than bid. Was chatting to finance guy from Norway recently - he was even more negative than what we see here (but then again, I never trust the word of a finance guy). I’m assuming the above mentioned person left gainful employment to follow his / her career aspirations & then be thrown out to pasture, without a penny in compensation. We can all now appreciate the callous way people are dealt with, when it suits one of these 3rd party employers. Pilots are a commodity. To be used and disposed of, when it suits the bean counters. The grey suits win. They laugh & move on . My thoughts go out to the pilot concerned. It must be a horrible situation to have left previous employment, to then be in limbo for an indefinite period. Without any income. Lets face it, who whould bank on an IAG takeover, when the more likely scenario it , as mentioned earlier, a slot picking fest over the carcass of Norwegian. It happened with Air Euorope in the ‘90s . Of course, the likely outcome is A huge rise in profit for IAG. About due another recession, especiy as the last one never really ended bar for stupid low interest rates. ​​​​​​I woul personally be very careful to consider weather it is a good time to jump ship or not depending on who your current employer is? I agree about the fear for an incoming recession; regarding to “ship jumping” I can think only of one or two employer (in easaland) where people can feel relatively safe during recession....sometime with an incoming recession is time to start to jump ships, depending on the current employer. It is a good decision to “take a breather” and review the company and trim it. At least the management is aware of it, why this plan has been put into effect. From what i have been told new 787’s will be covering for the AOG 787 awaiting engine changes. I am curious, what is there to trim exactly? I might be an external observer but it seems to me like the company is not exactly spending left right and center. Not much in terms of pilots salary and crew hotel accomodation I would say, the conditions I have seen are already far from great on both fleets. Tell that to the pilots who were working their notice, and perhaps their current employer would not allow them to withdraw their notice? Again Norwegian reacting without thought to how they are going to effect people's lives. I sent my CV to Norwegian before summer and was offered an assessment which I never booked. Occasionally they email me with the application form again asking me to complete it - which I ignore. I find it odd that they emailed me with the same form this morning given the above. Case of the left hand not knowing what the right hand is doing. Happens all the time in big companies. Not much of a point to join a company if it goes under either. It is absolutely the right thing to do, take a breather and make sure the business is sound going forward. Short term pain, long term gain. Most unfortunate for those waiting for a course but much better that than the whole company looking for a new job. The 737 stuck in Iran and the Gatwick closure must have cost millions and action had to be taken, doing otherwise would have been extremely foolish. In addition if RR has not yet found a permanent fix it would be madness to just keep taking in airframes and making the problem bigger. Location: Not over the Rockies anymore. it says in the email you wil be refunded all cost...what exactly are you paying for?? Are you really that naive?! divesting 140 airplanes is indeed an "adjustment"